This digital HD TV tuner lets you watch free over-the-air digital channels using an indoor or outdoor antenna of your own. Starts enjoying free TV broadcast channels over the air with crystal clear HD quality. This tuner box finds digital broadcast channels in your area and decodes them into HDMI formats for HD output to LCD TVs, monitors/projectors or regular composite RCA A/V and RF outputs for DVD recorder. [Note]: The TV channel quality and numbers of channels received depends on the antenna used, location, and weather. This DTV tuner box can be a great antenna tuner module for those LCD monitor or projector that does not have TV tuner built in. It is also a great add-on for those analog TVs or DVR systems. Its on-screen menu operation makes the setup quick and easy. All the major features and functions such as closed-captioning, parental control, EPG, sleep timer, last-channel memory or favorite channel list can be easily accessed from the on-screen menu or the supplied IR remote controller. This digital TV tuner also supports recording of TV programs. Users can do instant recording or schedule recording of TV program on a daily or weekly basis. USB drive is needed for TV recording and not included. This digital ATSC TV tuner is a great digital tuner module for older televisions, video monitors or projectors that do not have RF input or built-in tuners. It is used as digital antenna receiver for receiving over-the-air local TV signal through broadcast. This unit provides simultaneous video/audio outputs through its HDMI, RCA A/V and RF coax connectors. Its coax output can be set for output to TV channel 3 or channel 4. Its composite RCA video/audio output or HDMI output are handy for connection with any digital or analog displays such as LCD monitor, projector or any LCD TV. The HDMI output supports maximum resolution up to 1080P. This ATSC tuner also has the capability to decode certain unencrypted clear QAM channels such as local broadcast stations, public-access channels or private QAM channels generated by modulators. [Note]: This tuner is mainly designed to receive over-the-air channels. Its QAM tuner portion can NOT work as a digital cable box for decoding those encrypted QAM channels. This digital TV tuner also supports recording function of TV shows when a USB drive is plugged into its USB port. USB drive is not included in the package but required if recording is needed. The USB port supports external USB drive up to 3TB of storage. Users can watch the recorded shows directly played on TV from the USB drive connected or take the USB drive and plug into a computer to watch their recordings. 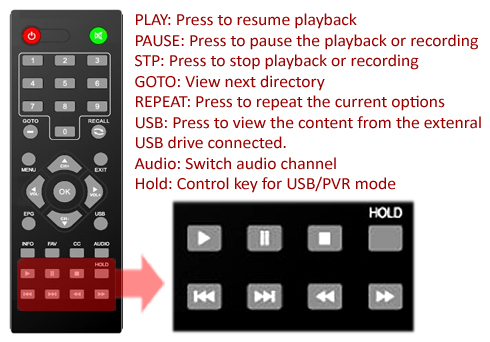 Instant Recording: simply press the "REC" button on the IR remote to record what is displayed on the screen. Scheduled Recording By Timer: users can add the date/time and frequency of occurrence in the "Timer" list for recording events. Scheduled Recording By EPG: users can pre-schedule the recording events based upon the TV program guide. Using the IR remote to display the TV program guide on screen and add the desired TV show schedule to the recording list. The time-shift function is a great feature for users never missing out any part of the TV shows. It allows users to pause the live TV program during the commercial break. Once paused, the rest of TV program from that point on will be stored on the connected external USB drive temporarily. When ready to watch the skipped TV show, users can simply press the "PLAY" button on the remote to watch payback from where being left off. Users can also do fast forward or rewind using the remote control during the playback. This DTV tuner is designed for easy operation. Its quick, user-friendly OSD menu makes getting started a snap. Simple user interface with easy on-screen guide and system menu on the screen. Users can finish the channel scan in a few minutes to get it working fully. This digital TV tuner has a built in EPG [TV Channel Guide] giving users a full list of TV show schedule, allowing users to easily decide what to watch and record. This digital broadcast tuner for aerial antenna is featured with closed caption capability to display subtitles or text on the TV screen, making it a perfect choice for the hearing-impaired or silent viewing with no loud dialogues. This digital ATSC antenna tuner supports parental control with V-Chip technology. The V-chip allows parents or other caregivers to block inappropriate TV programs for benefit of young viewers. Most TV programs are now assigned a rating and the rating is encoded with the program before it airs. Parents can use the remote control to program the V-chip to block the display of programs that carry certain ratings. 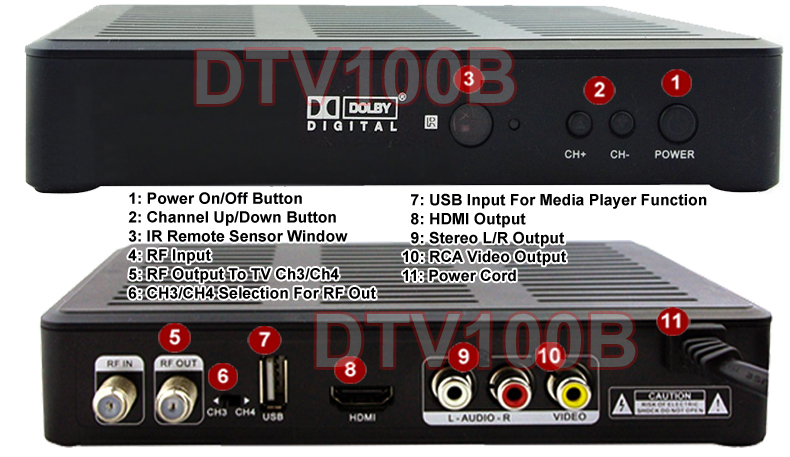 Once decoded by this DTV unit, the broadcast TV channels can be transcoded into standard RCA video/audio format for recording by a DVD recorder, DVR, computer-based capturing device or other type of video/audio recorders. This external TV tuner is fully operated and controlled via IR remote controller. Watch your TV channels just like the way we were using the TV remote to flip through channels, mute or turn up TV volume. This TV tuner also supports digital media player function through its USB input. Users can connect USB storage device such as USB flash drive or external USB hard drive to this digital TV tuner and play video, photo or recorded TV programs to TV, LCD monitor or projector for large-screen display. A more convenient way for users to watch the downloaded movie or recorded TV program or photo images on large-screen LCD TV for visual entertainment. All the main media player function of this HDTV tuner can be controlled through using the supplied IR remote controller for major functions such as play, pause, stop, repeat, rotate, zoom, move and capture. One-time or looping play, slideshow, thumbnail browsing and other control buttons are all accessible from the on-screen menu. Video files: AVI, MPEG1, MPEG2, MPEG4, DAT, VOB, MKV, MJPEG format for video playback. Photo files: JPEG, BMP and PNG format for photo image playback. Audio files: MPEG, MP3, AAC format for music file playback. Premium digital ATSC TV tuner for receiving free over-the-air digital broadcast through antenna of user choice for North America areas. Enjoy digital TV programs on your HDTV set, projector or analog TV. Simultaneous HDMI out, composite RCA A/V and RF output for connection with all TVs. Maximum HD output resolution up to 1080p. Supports instant real-time recording and scheduled recording of selected TV channel programs and saves recording into USB drive of user choice for playback later. Supports time-shift function so users will never miss any part of the TV shows and easily skip the commercials. Maximum USB external drive support up to 3 TB or flash drive up to 64GB. Supports EPG (Electronic Program Guide) for program information and closed captioning. Easy setup and intuitive graphical interface with on-screen guided setup. The built-in USB media player function supports playback of video, music and movie files contained in a connected USB drive. Supports media player functions for playback of graphic and audio/video files. Selectable aspect ratio control in 4:3 and 16:9 mode for all HDTV and standard TV sets. Dual digital audio and stereo analog audio output. Supports timer function for auto start and auto shutdown. Supports last channel memory after power-off or power outage. Stay tuned to the last channel after power-off or power outage event. Supports parental control with V-Chip technology, allowing users to block inappropriate TV programs. Compact size with metal enclosure and full-function IR remote controller included. Video files: AVI, MPEG-2, MPEG-4 H.264/AVC SD/HD, VOB, MOV, MKV, MJPEG format for video playback.